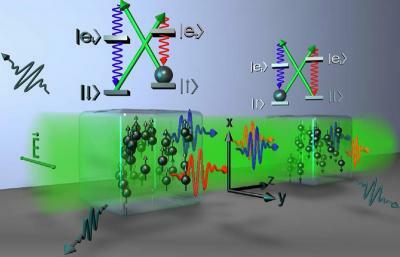 Quantum communication could be an option for the absolutely secure transfer of data. The key component in quantum communication over long distances is the special phenomenon called entanglement between two atomic systems. Entanglement between two atomic systems is very fragile and up until now researchers have only been able to maintain the entanglement for a fraction of a second. But in new experiments at the Niels Bohr Institute researchers have succeeded in setting new records and maintaining the entanglement for up to an hour. The results are published in the scientific journal Physical Review Letters. Entanglement is a curious phenomenon in quantum mechanics which Albert Einstein called “spukhafte Fernwirkung” (spooky action at a distance). Two separate entangled systems have a ghostlike connection even when they are placed at a large distance without being directly connected to each other. It is said that their states are correlated. This means that if you read out the one system, the other system will ‘know’ about it. In the experiments at the Niels Bohr Institute, the spins of two gas clouds of caesium atoms are entangled. To create the entangled state of the two atomic clouds the researchers use light. Light consists of photons, which are the smallest parts (a quantum) of a light pulse. When you shine a laser beam on atoms the photons are absorbed and subsequently re-emitted spontaneously. This process has been an impediment to the experiments because it is uncontrolled. “Now we have managed to control this ‘spontaneous’ process and use it,” explains Eugene Polzik, Professor and Director of the Danish National Research Foundation Center, Quantop at the Niels Bohr Institute at the University of Copenhagen. In the Quantop laboratories the research group conducted experiments with entanglement using two clouds of caesium atoms placed in separate glass containers. By illuminating both clouds of atoms with laser light, the collective spins of the atoms are manipulated. The two atomic clouds become entangled, which means that some of their properties are correlated. But the atoms emit photons in all directions and this causes the entanglement to disappear. This usually happens in a fraction of a second. “What we have done is that we have developed a technique where we renew the entanglement as fast as it disappears. In this way we have been able to maintain the entanglement between the two atomic clouds as long as the experiment lasted, that is to say up to an hour,” explains Hanna Krauter, who is a quantum physicist and researcher at Quantop at the Niels Bohr Institute. The research has been conducted in collaboration with the Max Planck Institute of Quantum Optics in Germany, where they have been working with the theoretical models. Theoretical physicists have suggested similar techniques for about five years, but it is only now that the NBI team has succeeded in conducting the physical experiments based on these methods and getting them to work. “The breakthrough has great potential and provides, among other things, a new approach to quantum communication. It is a step towards getting quantum communication to function in practice — not just in the laboratory, but also in the real world of networking á la the Internet. In addition, it means an improvement of ultra-precise measurements of miniscule magnetic fields with atomic magnetometers. Sensitive magnetometers could be used to measure electrical activity in the human brain and heart,” explains Professor Eugene Polzik.